I’m fairly time-poor at the moment, but I wanted to at least make a small note about a couple of books I’ve read lately in preparation for the Sydney Writers’ Festival next week! I’m a big fan of Paddy O’Reilly’s short story collection The End of the World and I’d been told to expect something quite different with this novel—more commercial, I guess, though we all get a bit confused about these distinctions sometimes. 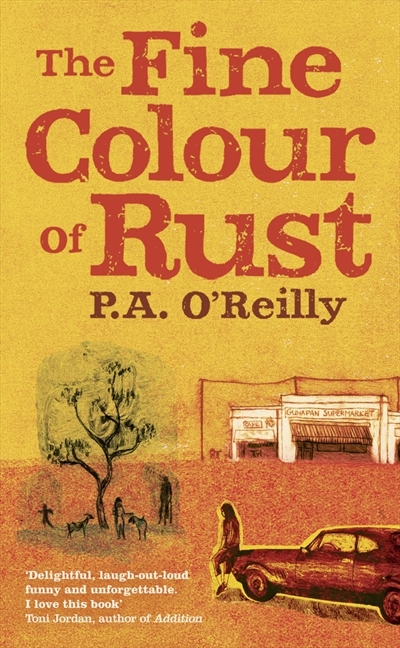 The Fine Colour of Rust is a bright and funny story of a teeny country town called Gunapan and its big-hearted and bold resident Loretta Boskovic. Loretta is a single mum (like many of the women in Gunapan) and she’s a perfect mix of hard-edged and dreamy. She may go off into fantasies about men in BMWs whisking her off (away from the kids), but when it comes down to it, Loretta will fight the fight that no one else dares or cares to. She’s thoroughly human, she cares about what others say about her and her kids, but she also doesn’t let it get to her for long. She’s both tough and tender, and she’s hilarious. I did some serious LOLing while reading this book. There are other memorable characters, like Norm, who runs a metal scrapyard and knows everything that’s going on in town; and a pair of goats that soften Loretta’s difficult daughter Melissa. This is a warm and affirming book that doesn’t exactly go in the directions you may expect. Loretta is allowed to remain complex. I’ll be chairing the panels ‘Not Funny Strange‘ with PA O’Reilly, Charlotte Wood and Chris Flynn (free) and ‘Rural Romping‘ with PA O’Reilly and Carrie Tiffany (ticketed) on Thursday 17 May at Sydney Writers’ Festival. Stuffed if I know why it’s taken me so long to get to this, given how big a fan I am of Amsterdam’s writing. This book is entirely different from Things We Didn’t See Coming but there’s something of a similar subtle heart-wrenchingness. The poignancy really sneaks up on you. On the surface it seems like a book about a bunch of related characters who are each granted a special power—invisibility, flying, super-strength—but there are layers of meaning beneath. Characters grow up and grow old, deal with desires and impulses, distances, and losses. ‘They were all separate, scattering like planets without even asking each other if it was okay.’ There are consequences to their choices and to their powers. The way some characters connect and understand each other, and others don’t, is also deftly handled. 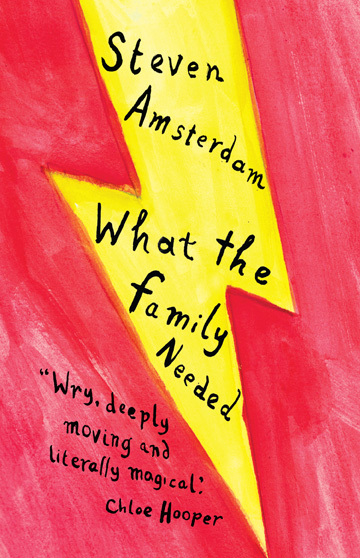 Amsterdam’s prose is clean and fresh, loaded with subtext. 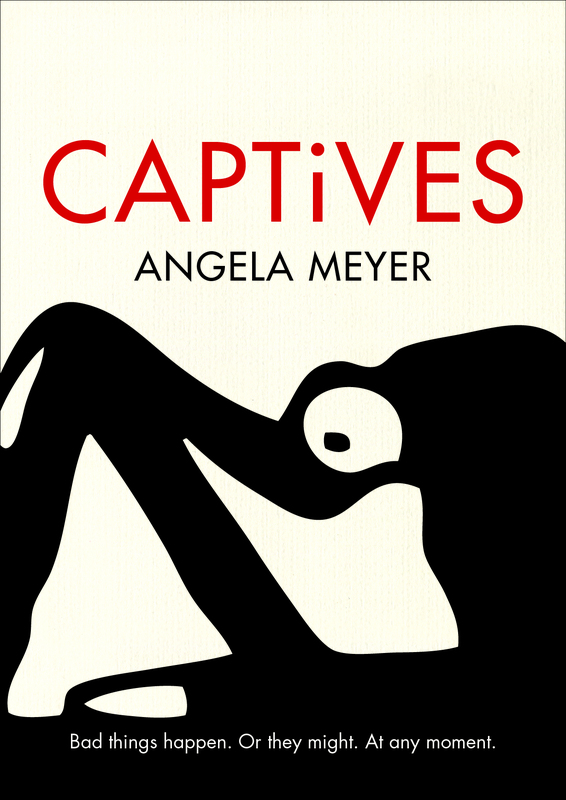 This book could be read really differently, too, by a rationalist or a fantasist. It reminded me a little of Joe Meno, the American writer; the combination of ordinariness (and children, and family) and strangeness or other-worldliness. There is space for the unknown and unexplainable, from Giordana not knowing why Janelle would be attracted to her brother, to why or how Ben can fly. This is a strongly empathetic book, and a book of wonder. I’ll be chairing the panel ‘The Second Time‘ with Steven Amsterdam, Kirsten Tranter and Deborah Forster (free) on Thursday 17 May at Sydney Writers’ Festival.